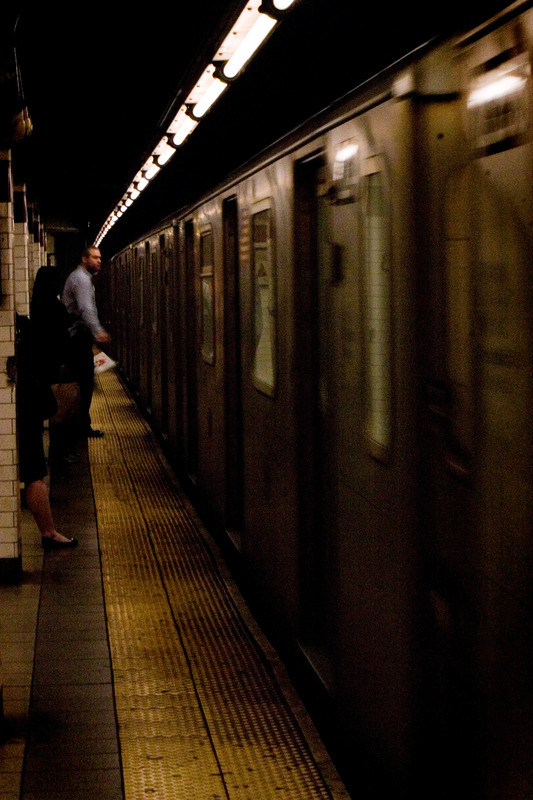 NEW YORK CITY — Late night concertgoers jolted to a stop on the Downtown R-train returning from Carnegie Hall. Still mesmerized by the climactic final notes of Beethoven’s “Eroica” and the astounding following applause, the subway seemed very quiet. When the train doors opened and travelers stepped onto the station platform, a new composition was already being performed – the music of New York City. Cars honk, voices chatter, train rails screech, turnstiles beep and click and above it all there’s bass, drums and the lyrics of John Lennon. To some passing by and to the moonlighting band, this performance is just as wonderful and vivid as the Uptown concerts. Meet The Meetles, a Beatles and 60’s era tribute band. They’re playing their Friday night set in the subway station at 34th Street and 6th Avenue. A few people pass and watch, throwing bills and spare change in an open black duffel bag. Part of the Metropolitan Transit Authority’s “Music under New York”(MUNY) program, The Meetles and 350 other musical and performance talents hold mini-concerts at 25 allocated stops along the subway lines. Since space is limited, auditions are held every spring for the coveted slots. When considering candidates, variety and quality both factor in heavily. What’s the most important thing about groups like the Meetles? They make their living outside of subway music, but they keep coming back to play anyway. Since the MTA’s program began in the 1980’s, artists have swarmed to play violins, dulcimers, spoons, log drums and more. According to Lydia Bradshaw, general manager for MUNY, most are not looking for some sort of big break. Fast forwarding to a muggy Monday in Grand Central Terminal on 42nd street, crowds of hundreds of passengers move sluggishly through the haze of May and humid, stale station air. Set up against a wall in the Graybar Passageway, a slender woman sweating through her tank-top practices a few quiet notes on a guitar before turning on her amp. Wendy Sayvetz doesn’t have to be here to play and sing on a miserably warm day, but she wants to because it’s good for her career and her audience. Sayvetz has been an MUNY performer for 20 years. She found that when she first started her career in music and began playing in the subway, the work was immediately financially viable and her career jumpstarted. After hearing Sayvetz’s delicate soprano voice to a set of Simon and Garfunkel classics, those walking to their 4, 5, and 6 trains will inevitably pass a long-haired young man singing in the mezzanine. Laying out “Hotel California” on an acoustic guitar and tapping green sneakers on the yellow tiles, he’s got a lot of heart in his mellow voice, but very few people stop to listen. A female voice crackling harshly over the loudspeaker is competing for importance, but the man keeps playing doggedly. Joe Taylor doesn’t give up a gig for train announcements. Joe Taylor in Grand Central performing a set on a humid afternoon. A singer and songwriter from Los Angeles, Taylor heard about MUNY through living in New York. Already a musician, he would see pass artists playing their underground show. 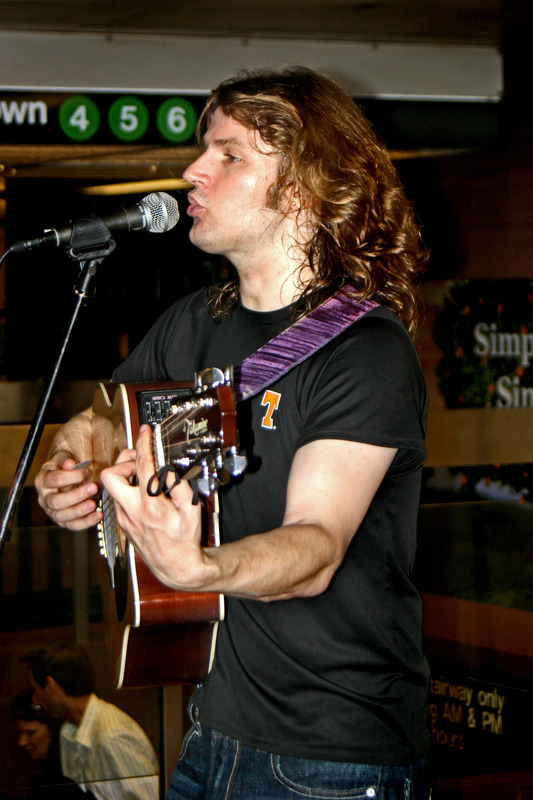 “You see people performing and you think, ‘Huh, maybe I could do that!’” A few years later and he’s touring around North America, producing Top Ten hits in Canada and jamming out within the subways. Two of his albums, “Save Me” and “Try”, are even available on iTunes and Taylor assures that there’s more to come. A two-year veteran of the program, Taylor sees his subways performances as a means of survival, but beyond that he loves being underground to reach out to people. While in the middle of a soulful rendition of “Beautiful” by James Blunt, a hurried man in a pinstriped suit drops a few crisp dollar bills in Taylor’s open guitar case. The act of recognition does not go without a thank you from the artist, even in the middle of the chorus. 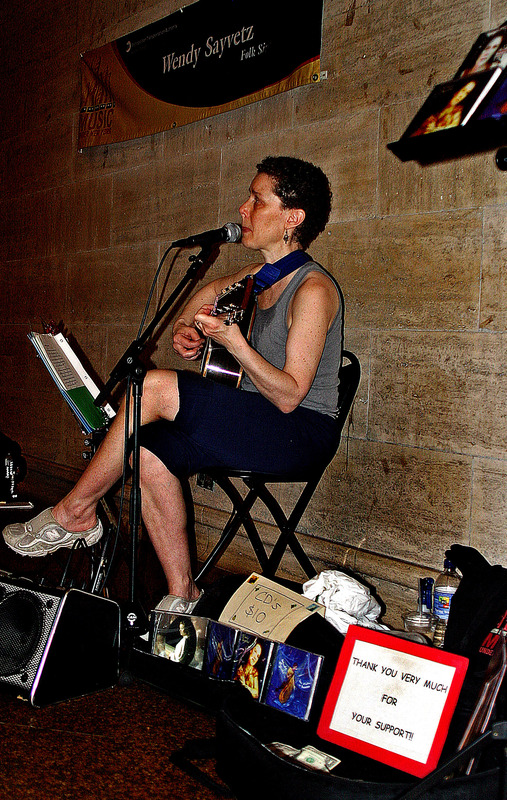 Hundreds of artists compose the subway’s musical talent, and many like Wendy Sayvetz and Joe Taylor have much bigger careers outside of the MUNY program. Their real love for their music and for people is evident in the care they take to show up and play their best, regardless of the response they receive and the conditions that they face. The program has continued to further their careers and give them the opportunity to affect the thousands of people who pass by every time they play. I have been writing ever since I could read, and before that simply using my imagination. I write, think and love deeply. Posted on June 2, 2010, in Uncategorized. Bookmark the permalink. 3 Comments. LOVE the musicians in the subway! Some of them are really amazing. did you ever run into the ‘Saw Lady’? She plays the musical saw (http://www.sawlady.com/blog ) in the Union Square subway station. Guaranteed to put a smile on my face, every time. These musicians give NYC its character, which I love.